We’re still on a beautiful weather kick in SLC! It’s been absolutely beautiful; sunny, warm and no sign of winter in sight! It honestly feels like it’s late April right about now and the best part…it’s not complete torture to shoot my daily outfits (it’s actually enjoyable again ;). A couple of days ago, I was feeling so much in the spring mood that I even pulled the sandals out and paired them with a Lauren leather skirt and sweater. Perfect combo for a spring-like look that’s modern, feminine and chic. Happy Thursday!! this post is in partnership with Lauren Ralph Lauren and InStyle, all opinions are my own. .
Love this look! That skirt is gorgeous on you! I love the sweater and skirt combo! Chic but still a little cozy for the nippy spring air! gorgeous outfit, that skirt is perfection. I love this ensemble! It’s edgy but still ladylike. Loving that skirt and your heels. Great pics. Great look and so jealous you are experiencing nice weather in SLC! Beautiful!!! I love this entire look. 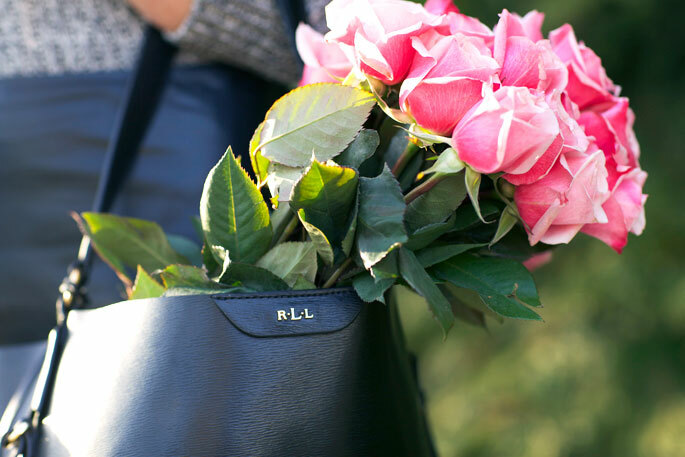 I love the addition of the roses, they should become the new must have accessory! Can you imagine? Every one wandering around with vibrant flowers – amazing! This is such a simple outfit but super super cute. You make everything look so so glam and gorgeous! LOVE this look, absolutely stunning! i saw your husband’s instagram post and oh my gosh i was dying laughing but i must say, those roses do look pretty perfect!! Love feminine and edgy, this is a very cool look. Those roses are gorgeous though! What a fun collaboration. I love the sweater skirt combo! Gorgeous outfit!!! Absolutely love that skirt. I love this feminine but edgy look. Well done Rach! Love this look! The heels are fantastic, also really loving the Ralph Lauren top & skirt! Great to see that you guys in Utah are having great weather. Love the look you have on. Love this skirt! The flowers really make the pics special. So pretty! Wow that bag is amazing. love this outfit! and the pink touches are perfect! jealous of your weather! Love the gold monogramming on the bag! Simple and classy!! Love this look girl.. I like every part of this outfit! hey! such a great look! love black! 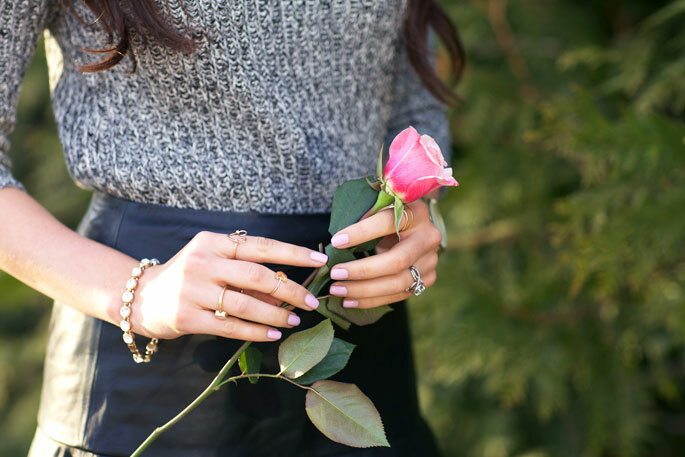 so feminine…and spring is so enjoyable! Gorgeous! Those flowers are beautiful! I’m ready for the snow to melt here in Minnesota! What a sweet outfit my dear. That skirt is a delight and looks so flawless with the knit. WOW, I absolutely adore this look! I wear these sort of clothes on an every day basis. Only difference is probably the material of the skirt. But other than that, this look is perfection! Truly. Rach! You look so beautiful in these pictures! I’m not use to seeing you without a bold lip colour!!! And so jealous of those bare legs – it’s still SO cold here! You really can’t go wrong with a little leather and grey! Love how this works pretty much any season! Love this look! Those heels are so pretty! This look is so beautiful! This look is absolutely spring ready. It screams sophistication AND very classic and girly! I wish we will have something like this weather here soon! What a gorgeously romantic outfit! 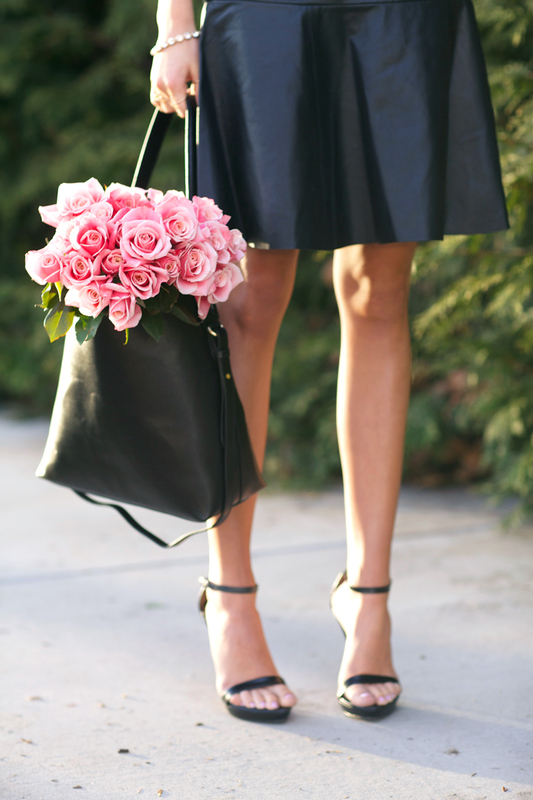 I love the flare of this leather skirt! Loving that skirt! Wishing I was in Utah right now to reap the rewards of that sunny weather and spring clothing! love that skirt – it’s so flirty! great look. This skirt is amazing! It might have to become part of my closet! Love that nail color! What is it? Oh my goodness this is possibly my favourite look yet. Love the elegance and the simplicity, Rachel! The flowers are beautiful too! Love the hardness the leather brings and the softness the sweater adds! Great contrast! Love the fit of the leather skirt! I simply adore this outfit….! just perfect! I absolutely love this outfit! Roll on Spring! Those heels are perfect! I love fresh flowers, those roses are stunning! TDF! Love it all & WANT that bag! The flowers are the perfect pink touch to top it all off. I love the shoes. They can practically go with anything.